Sometimes you just need a good crunchy food and nuts just do not cut it! When I first started eating NSNG, there were some foods that I absolutely missed. Potato Chips, unfortunately was one of these foods. When I first took a bite out of these cheese chips, I thought I was biting into a cheese nip. 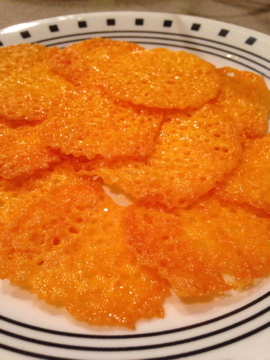 Once the cheese is baked, they are crunchy just like potato chips are. I make these chips about once a week, and trust me they are excellent. Sometimes I eat them plain, and sometimes I dip them in a cheese spread or salsa. Try these for yourself, because you will not believe it until you try them! Preheat oven to 350. Line cookie sheets with parchment paper. Slice cheese into thin pieces that are about 1square inch. If you are using shredded cheese place about 1 tbs of cheese on the sheet. Cheese should be placed on cookie sheet like cookie dough. Season Cheese to taste if desired. Cook cheese in the oven for 10 minutes or until the edges of the cheese turn golden brown. Allow chips to fully cool before eating. **Note: When I made my batch of Cheese Chips, I forgot that my homemade yogurt was in the oven. Do not turn on your oven if you yogurt is resting like I did. Oops!